ABERDEEN, Md. 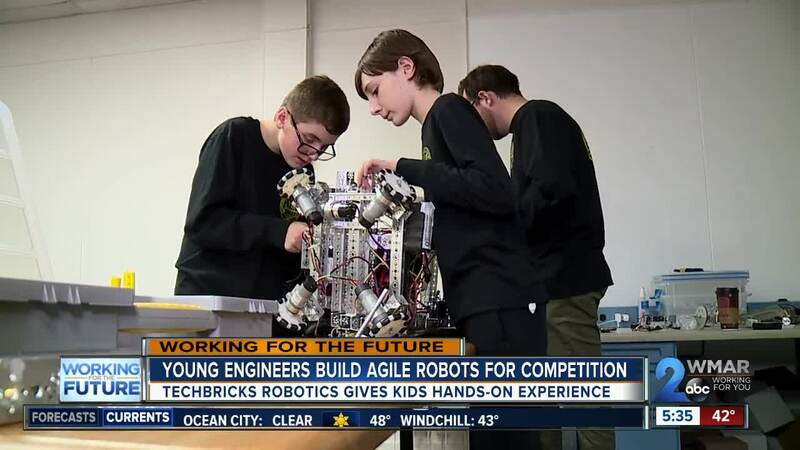 — At Aberdeen Proving Ground there is a battle ground for young engineers challenged with designing, building, programming and operating agile robots that can also function on their own. "It really helps you learn things you wouldn't learn in school," student Lila Dobry said. The TechBrick Robotics club meets every week. Completely run by volunteers, they teach the 7th through 12th graders the basics to create robots for competition, and then they break up into teams to let their imaginations run wild. Since September, the teams have been working on their robots and the three teams have had a very successful season. They all qualified for state championships in March, a first for the Harford County club. And now the really tough work starts. "For the next 4 weeks, it's basically a mad scramble," mentor David Hairston said. Hairston helps the teams review what works and what needs to change. "One of the teams is doing a complete rebuild because they felt their previous design was not very competitive," Hairston said. That's Gavin Savage's team. He says it's a lot of tough work; that if he wasn't involved, he'd have a lot more free time. But they all agree it's worth it. "I feel like this can challenge my brain," Savage said. Hairston's son Jonas is also involved and says it's not just about the skills they teach, but the environment. "At first I was a bit socially awkward, not knowing what to do," Jonas said. "It has definitely added to my social life." TechBrick Robotics also has a LEGO league for kids 5 to 13 years old and a team specifically for high school students and they also have clubs in Baltimore and Cecil counties. Some of the students have organized a free engineering showcase for the end of the month, to get more kids excited about all the STEM opportunities out there. They will have local engineers and scientists present about their experiences in STEM and then the robotics students will share how they are experiencing STEM through the program and show off their robots. It's Thursday, Feb 21st from 7:00-9:00 pm at New Covenant Presbyterian Church in Abingdon. Sign up here.